Young adults use credit cards and store installments to borrow to consumption that improves their material life-style, for instance purchases of new models of smartphones, computers or other electronic gadgets, weekend travel or vacations in distant foreign countries. Over-borrowing is a potential problem. One determinant is present-biased temporal discounting which in young adults may result from desires to purchase attractive consumer products that are not affordable. Research is reviewed that both supports and does not support this claim. Other determinants are a positive attitude toward borrowing for purchases of consumer products or low financial involvement and knowledge. Empirical evidence is reported that attitude is most important. A negative attitude may have the role of a heuristic that suppresses decisions to borrow. Ahlström, R., & Edström, S. (2014). 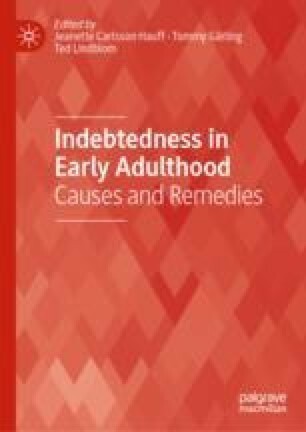 Överskuldsättning och ohälsa: En studie av hur långvarig överskuldsättning kan påverka den psykiska- och fysiska hälsan [Over-indebtedness and ill-health: A study of potential effects of long-term over-indebtedness on psychological and somatic health]. Retrieved June 29, 2017 from the Swedish Consumer Agency website http://www.konsumentverket.se/globalassets/publikationer/produkter-och-tjanster/bus-och-kvl/rapport-2014-16-overskuldsattning-och-ohalsa-konsumentverket.pdf. Eng Larsson, J., Hallsten, K., & Kilström, M. (2018). Skuldsättning i olika åldersgrupper i Sverige. Staff memo, Sveriges Riksbank, Stockholm. Available at https://www.riksbank.se/globalassets/media/rapporter/staff-memo/svenska/2018/skuldsattning-i-olika-aldersgrupper-i-sverige. Xiao, J. J., Ahn, S. Y., Serido, J., & Shim, S. (2014). Earlier financial literacy and later financial behaviour of college students. International Journal of Consumer Studies, 38(6), 593–601. https://doi.org/10.1111/ijcs.12122.